Welcome! Here is some information about Crafting by Concepts. The book (published by AK Peters, which is part of CRC Press) is available from CRC Press, AmazonUS (and Amazon Canada, Japan, Germany, UK, and France), Barnes&Noble, Magers&Quinn, Lacis, Bokklubben (Norway), Krisostomus (Estonia), Paddyfield (Hong Kong), Angus&Robertson (Australia), Borders (Australia), QBD (Australia), Booktopia (Australia), Mighty Ape (New Zealand), Fishpond (New Zealand), Waterstone's (UK), Blackwell's (UK), Kangcom (S. Korea), and buscalibros (Chile) as well. And here is the WorldCat/OCLC entry. So, how does this book compare to Making Mathematics with Needlework? 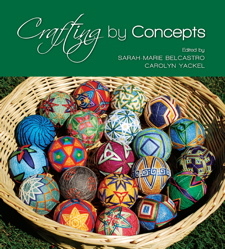 Crafting by Concepts has chapters (broken down into four sections each), and also has minis with only two sections (mathematical description and project instructions). The four sections in each chapter are an overview for everyone, a mathematics section for both enthusiasts and professionals, a teaching ideas section, and project instructions. Some of the chapters have multiple projects.